June 12th is the World Day Against Child Labour. The date was launched by the International Labour Organisation (ILO) in 2002 to focus attention on the global extent of child labour and the action and efforts needed to eliminate it. ChildFund and Fundação Telefônica Vivo (Telefonica Vivo Foundation) have been working together since 2012 for the prevention and combat against child labour in the Jequitinhonha Valley in Minas Gerais state, Brazil. This initiative mapped the areas in greater risk and now, after two years of work, there are already positive results for children and teenagers, as well as for the entire communities involved in the project. 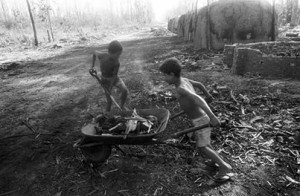 According to data from IBGE (Brazilian Institute of Geography and Statistics), in 2011 Brazil had approximately 3.7 million children in a situation of child labour. Among those, 1.5 million were concentrated in the north-eastern states of Alagoas, Maranhao, Pernambuco, Piaui and Rio Grande do Norte, as well as in Minas Gerais. For this reason, the region is the focus for the Telefonica Vivo Foundation’s activities, and the partnership with ChildFund is strategic to direct even more resources and investments into the region. Brazil is one the countries that is committed to eliminate the worst forms of child labour by 2015 and to eradicate child labour altogether by 2020, as proposed by the ILO (International Labour Organisation). A mapping of this region identified that the main activities performed by children were related to housework (such as cooking, cleaning, and taking care of siblings); services (working as child-minder or in commercial establishments such as auto repair shops, hairdressers, etc. ); agriculture (hoeing and taking care of animals) and craftwork. It is an area of the country where the majority of the population lives in rural areas, depends on subsistence farming and has a low HDI (Human Development Index), which contributes to a high occurrence of child labour. Among the children and teenagers identified as being vulnerable, 74% were in child labour or working under unprotected condition at the beginning of the project. Within two year’s work, ChildFund and Telefonica Vivo Foundation have already removed 46% of the enrolled children and teenagers from child labour conditions. “This is the beginning of our journey to eradicate child labour. It is important to see the success of our actions in a region so representative of our country, and still so neglected. It shows that we’re on the right path with our partnerships and efforts”, notes Patricia Santin, Manager of the Childhood and Adolescence Department in the Telefonica Vivo Foundation. ChildFund and Telefonica Vivo Foundation work with the Best of Me Project, acting through a local partner organisation in each of the communities served. That way, the service is direct and assertive. The project assists municipalities in the Jequitinhonha Valley, more specifically Veredinha, Minas Novas, Jequitinhonha and Comercinho. The Best of Me project applies a methodology called Aflatoun, which consists of social and financial education for children and youngsters as a way to stimulate them to save resources (not only financial, but all kinds of resources available) and plan their life and their future. This is an innovative strategy for addressing child labour in Brazil. It is believed that, through the education of the children, their families will also be influenced to change their behaviour regarding savings and consumerism, and to enhance their understanding of the negative impacts of child labour. With support from Telefonica Vivo Foundation, ChildFund promotes socio-educational activities, such as workshops and meetings, in order to raise awareness among the families and community about the negative impacts of child labour. The aim is to promote a permanent impact in the communities and to contribute to the eradication of child labour. Join us in our efforts to eradicate child labour and improve children’s lives around the world: sponsor a child today!